I'm very aware that this blog has rather fallen by the wayside in the last year, so it's time for some rejuvenation. Seeing as I love cooking, and have added quite a few cookbooks to my collection over the past year, I thought it would be interesting (I hope!) to showcase the new recipes I try, and show how they turned out. I'm not going to commit myself to anything like making every recipe from a book in a year, or posting every few days, or anything mad like that. But I will try to post more often, and from a wide variety of cookbooks. For Christmas I received the adorable Rachel Khoo's My Little French Kitchen and The Little Paris Kitchen books. So, lots more French meals in our future! Yum. 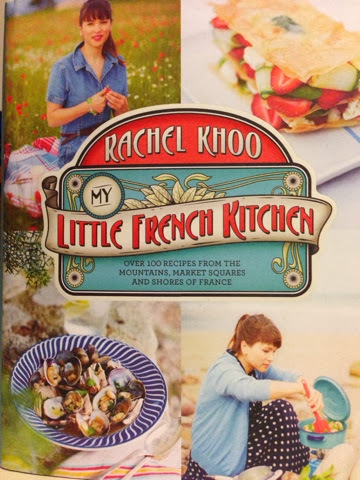 I really loved Rachel's TV series for The Little Paris Kitchen ... and her minuscule kitchen, with the bare minimum of equipment appeals to my inner minimalist, too. Tonight I made Haricots savoyard avec lentilles aux herbes ... 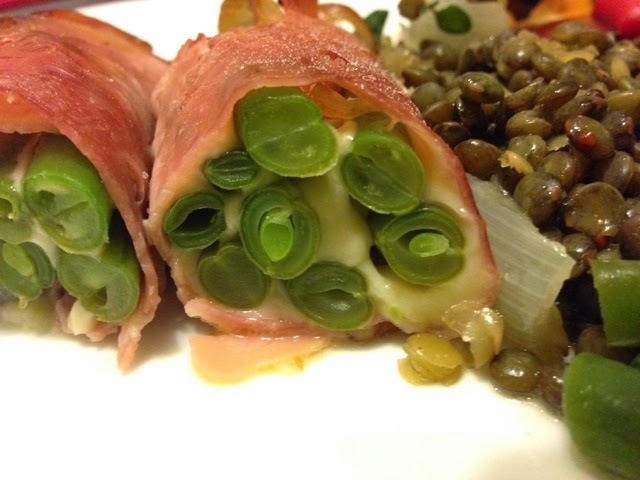 In other words: Green bean bundles with herb lentil salad. This recipe is from My Little French Kitchen, and is from the Lyon region. First of all you blanch nice long fresh green beans, for about 4 minutes in boiling salted water. 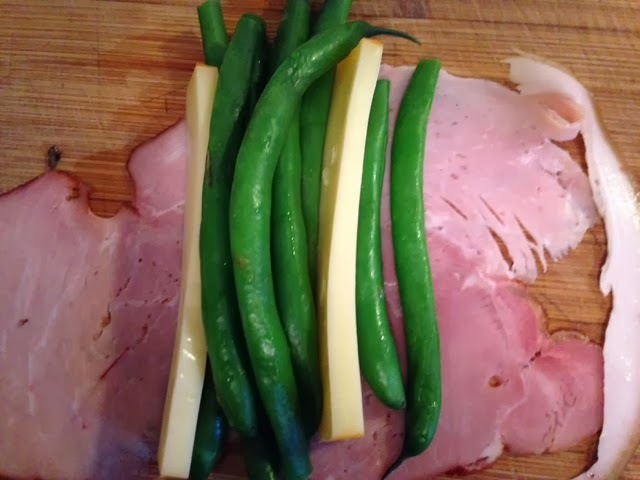 Slice the cheese into bean-long sticks. 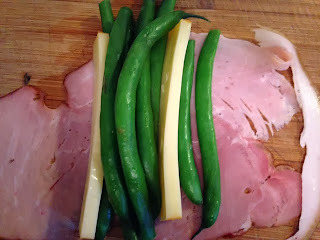 Then wrap bundles of beans with a few sticks of Beaufort or Gruyere cheese (my local grocer had neither, so I used St Claire cheese, which I think was a fair replacement). 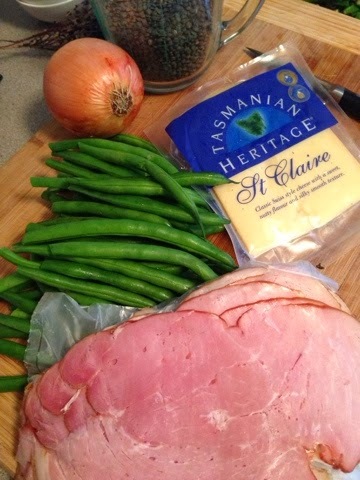 Then wrap the bundle with a nice slice of smoked or Parma ham. I got very thinly sliced ham, at the deli, and it really was a bit too thin. So regular thickness would be better. 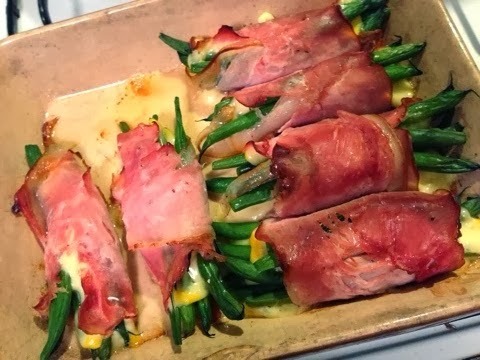 Pop these cute little bundles into a shallow casserole dish, and into a 180º oven for about 30 min, until the ham is nice and crispy. 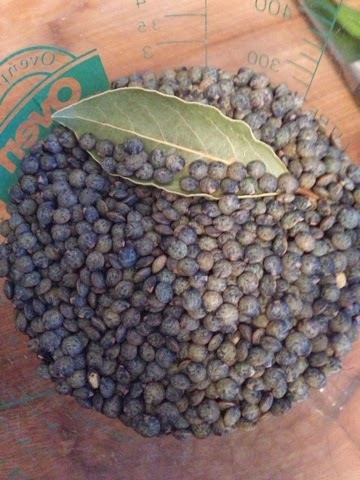 While these are baking, you cook the French Puy lentils in boiling water, and pop in a bay leaf. They take about 20 min to cook. Gently sauté an onion in butter with some fresh thyme. 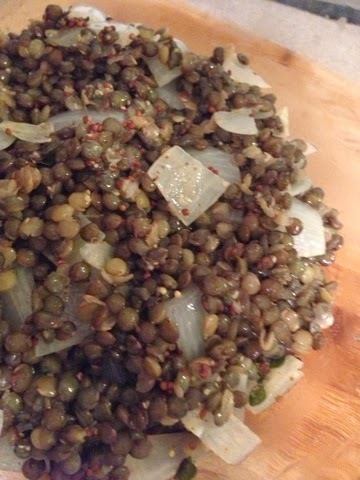 Then add the lentils and some grainy mustard. I've not had Puy lentils before; I'm not a huge fan of lentils, but these were very tasty, I must say. I gather they're called poor man's caviar. They don't break down into mush like red lentils do in Indian dhal, for example. 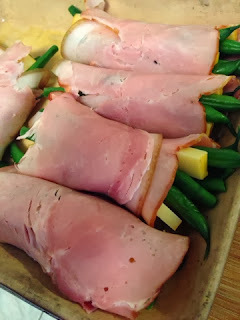 The beans with melty cheese and crisp ham were wonderful, and the lentil salad complimented them well. Definitely making this one again. If you search on the French title of the recipe, you will find it on Google Books. Aren't they cute in cross-section?! Looks delicious... I will definitely be trying this! Will definitely give the beans a go, but G will not eat lentils of any description, so won't bother with that bit of it. That looks really good. I am not a fan of lentils but I don't think I have ever had those.